Word. They aren’t perfect families. But God, in His grace, is doing a work in their hearts and homes. In this second episode of It is Your Life, we’ll take you to the beautiful mountains of North Carolina to visit the home of the Moody Family. You will be encouraged, challenged, and inspired as Trent and Angela transparently share the joys and challenges of raising a Christian family in an ungodly culture. You'll find the Moody's transparency in sharing their own struggles to be quite refreshing! DVD includes 40 min. of bonus features. 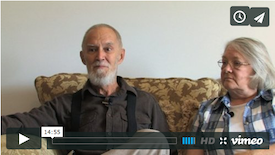 This film features interviews with Mr. and Mrs. Jerry States, a Godly couple and long-time friends of the Moody family. Mr. States went to Heaven in August of 2013 after having cancer for some time. In honor and memory of Mr. States, we put together a short video of him and his wife Barbara sharing their testimonies during our interview with them. Please click here to watch it. 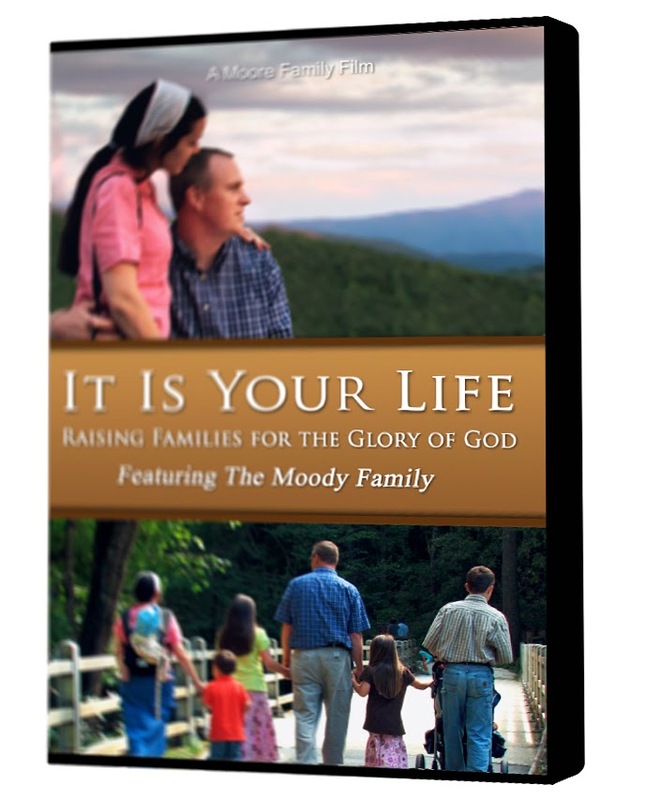 "It Is Your Life: The Moody Family, is our newest favorite from Moore Family Films. Very well made, and wonderfully professional, we are happy to have gotten to know and be inspired by such a Godly family. "This video shows the dedication of raising a family who fears the Lord, and seeks to glorify Him, focusing on fathers leading the home, the children being obedient and following their parents, and creating family intimacy rather than the world's individualism. Seeing a family who is seeking God's will, even when it goes against the grain (even in modern Christianity) is truly a much needed thing in today's society, and one that is inspiring. "The children LOVE each other. They WANT to be together, helping and nurturing each other. They want to honor God (and their parents) with all their hearts, instilled into them by the sound teachings of their parents. We were happy to see such a no compromise approach to what is right. Their goal is to obey God and follow His word and goals. The boys and girls know their God appointed roles, they seek to make themselves disciples of Christ, they live to glorify God, not to please self, and not to love the world and the things of the world. "Using strong and solid arguments to back up God's ways, they happily promote the joys and blessings of having large families and allowing God to plan family size. They trust in God and rely on his wisdom rather than human wisdom, a sad fact that even today's church has lost. They do not apologize for standing firm on things such as homeschooling being the right way, teaching their children to be responsible and bless others, hard work, homesteading and not relying on others, not wasting time on “entertainment”, and other important life aspects. "This video hits home and several issues of obedience to God that modern Christianity refuses to come to terms with; A nearly flawless balance of how Christianity is demonstrated by a family. It offers subtle rebukes of this generation, such as how they fail to care and honor the elderly. They are prime examples of selfless living for others. The Moody family holds up the unpopular Biblical standard in the face of a culture that honors God with their lips, but their hearts and actions are of the contrary. We cannot praise nor thank the Moore family enough for sharing such a beautiful and much needed message." "In this intimate portrayal of the Moody Family, this documentary does an impressive job of highlighting the foundational principles upon which strong families are built. "It’s a great “how-to” for families who may be new to the concept of growing family ties and placing the Lord at the center of family life...I think you’ll find the film to be a blessing and a refreshing reminder of God’s faithfulness." "The Moody family is a real family. They do not claim perfection which is good because sometimes we can get the impression that other families don't have any problems. But what this film is mostly about is family togetherness and serving the Lord as a family. It is about a family that seeks to serve the Lord in all that they do. It is about a family that loves the Lord and loves each other. "Since the Biblical family gets attacked almost everywhere in the media, and at times even by some family, friends, and churches, I am so glad the Moores have put out this new film. You will be inspired as you see that yes, there are really other families that seek to give each area of their lives to the Lord. There are also other important areas covered in the DVD such as caring for elderly parents, the dynamics of large families, chores for children, sibling relationships, biblical reasons for teaching your children at home, and much more! 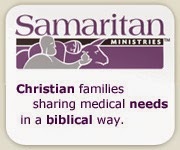 I definitely recommend this video to all Christian families, and it is even great to watch with your children. They will love it too! My children ask to watch the Moore Family Films videos over and over again." "This movie is such an inspiration and encouragement to raise our families in a biblical manner! While not each and every aspect of this family’s life may be something you choose to follow, it is inspiring to see a family follow God and make Christ the center of their home.I recommend it..."